The fall of the once-mighty Guitar Hero franchise was shocking but analysts say Call of Duty, Activision's other heavily-flogged flagship game series, won't suffer the same fate. The rise and fall of Guitar Hero is a spectacular and cautionary tale. It was one of the most revolutionary games of all time when it launched in late 2005 and single-handedly turned the music game genre into one of the industry's most reliable money-makers. Yet earlier this month Activision pulled the plug on the series after the most recent release, Guitar Hero: Warriors of Rock, tanked, an ignominious end to a once-legendary franchise. What happened? 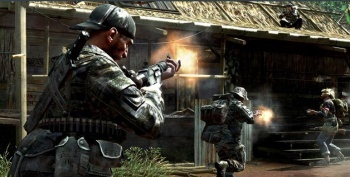 And could another big-time Activision property, say, Call of Duty, suffer the same fate? Not likely, according to several industry analysts who spoke to IndustryGamers on the matter. While any regularly iterated game series risks "franchise fatigue," Jesse Divnich of EEDAR said Guitar Hero and Call of Duty are "two different franchises with two different demographics. I don't believe any lessons learned from the music category applies to the Call of Duty franchise." The most important difference between the two is that Guitar Hero, and the music game genre as a whole, was a fad that was bound to die out sooner or later. "With GH it seemed that it was very likely to be a fad that would be milked until it dried out. It was somewhat the same issue as extreme sports and hunting games," said David Cole of DFC Intelligence. "FPS games are a long proven genre and thus don't seem to have fallen into that fad issue." Some analysts, in fact, praised Activision's handling of the property. "Guitar Hero and other former franchises may appear to be publisher failures, but the truth is that strip-mining franchises is a successful, risk-averse strategy. [Activision] made good money on GH," said Billy Pidgeon of M2 Research. "The 'hit it and quit it' model -- carpet-bombing the market with sequels and then slashing the assets -- pays off big in the short term, so [Activision's] shareholders are happy." There's no suggestion that the Call of Duty franchise is immune to a similar downfall, but the general consensus is that as long as Activision maintains a high level of quality and keeps its online audience engaged, all will be well. "This is a franchise that has increased in sales every year for the past six or seven years and has consolidated market share in the process," said Colin Sebastian of Lazard Capital Markets. "Could Activision mess it up? Sure, but if they focus on maintaining high game quality, fresh story-lines, and online multiplayer, then I don't see an obvious reason for the franchise to decline."